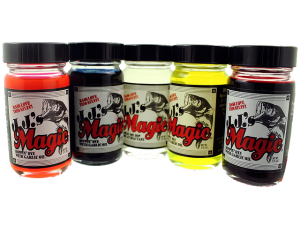 J.J.'s Magic is a specially formulated dippin' dye that allows you to change the color and add Garlic Scent fish attractant to your favorite soft plastics or skirted baits in one easy step. Just dip the portion of your bait that you would like to add color and scent to, let dry for a few seconds and you're ready to fish. You now have a bait with a permanent color & garlic scent. If your prefer not to add a color, use the Clear Garlic. No oily mess to deal with once your bait dries. If you double dip your soft plastic bait in any two of the color dyes you can create different hues of green, orange, and purple depending on the color of the soft plastic bait used. 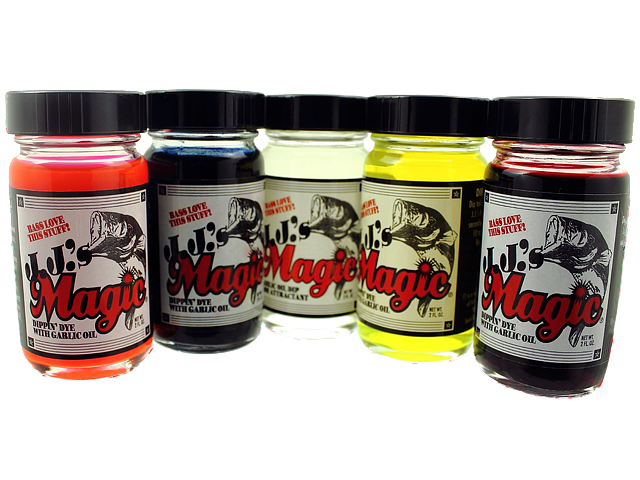 J.J.'s Magic also comes in a clear garlic oil dip fish attractant. You can either use as a dip or pour a little in the bag of soft plastic baits. Dippin' dyes are not a science, but an art. The more you try, the more combinations you will find that will work for you. This will give you a tactical advantage over your competition. Remember – more bites, more fish!